Live and Loud! Radio is an occasional series of free downloads, starting January 2017. Radio sessions that never got an official release, sympathetically repaired and remastered and then released onto the internet, all for free. No theme tune, no intro from me - just the original session, repaired and remastered and available in a downloadable zip file containing each separate track. The only files I could find online were fairly low bitrate MP3s of a sometimes quite noisy and harsh recording so these were saved as WAVs for working on. Hiss reduction applied to reduce - but not eliminate - quite a lot of the noise. Each track then had 30 band EQ to remove top end harshness and enhance the lower end - kick drums and bass synths. The middle was then eased down a bit make it clearer and create more "space" in the tracks between the instruments. Sounds far better now. Enjoy! And Even Fantastic Ultravox....When Midge is singer. These latest from Lyon France With Ultravox was pure Best..Such a Best Singer Midge ure is !! Btw Have you any Recording with Messengers ? They was support act to Ultravox 1984, 1985, 0r was is 1982,, i imagine...Will be super if you have any Recording With Messengers !! Thanks Tomas - glad you've found stuff to enjoy on here! 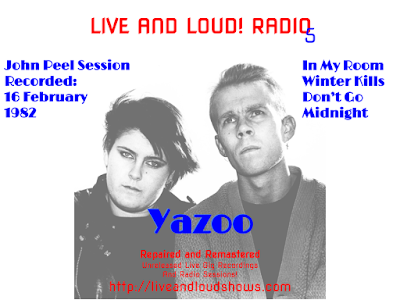 Check out also the Yazoo gig from 1982 on this site, if you haven't found it yet - just look under "Yazoo" in the tags on the right and you will find it!